The church is Roman Catholic and stands in the hills of the Sauerland in a village of about 360 people. It is a small church, but with a good acoustic, built at the turn of the 20th century in traditional Gothic style with three Rhenish vaults. It was redecorated using modern fittings in the late 1970s. The organ was opened on October 12th 1997 with musical contributions from the Schola (four part choir), male voice choir and wind band, and local organists. The new organ was designed in the tradition of Father Smith, using the surviving parts at St Mary’s Finedon in Northamptonshire (Bernard Smith 1704), and St Lawrence Whitchurch, Little Stanmore, Middlesex (Gerard Smith 1716) as models. The project leader was Marcus Stahl, now working as an independent organ builder in Dresden, Germany. 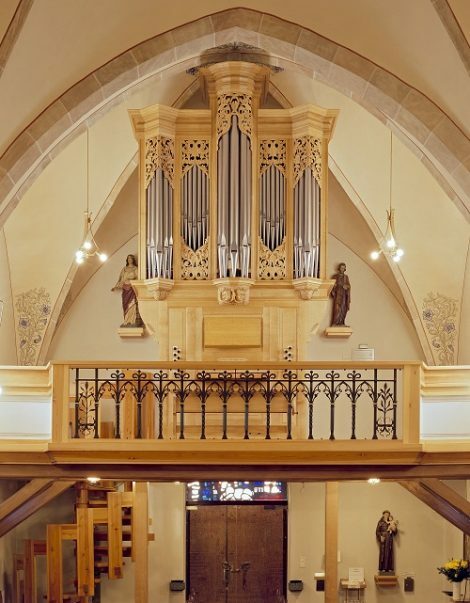 For the parish the project was guided by Bernhard Kubiak and Dieters Moers, organist at St Martinus Olpe. The ranks marked * are available on either manual; the Stop Diapason can be used on both keyboards simultaneously. Compass C – g3 and C – f1 The pitch is a1=440Hz. The tuning is a Bach tuning developed by Mark Lindley. The wind pressure is 58mm.